Netzach Yehuda Battalion holds first swearing-in ceremony since Givat Assaf attack. 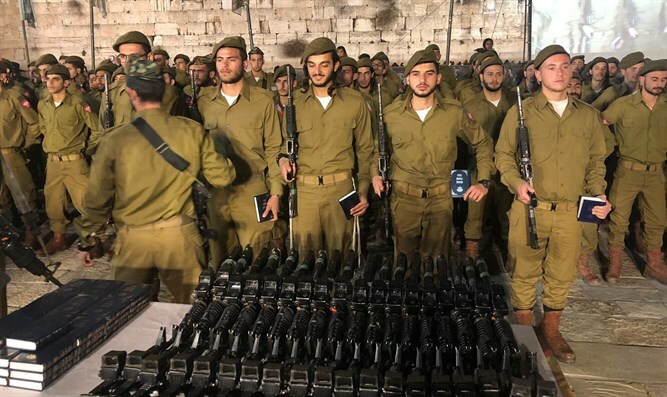 150 fighters from the haredi Netzach Yehuda Battalion swore allegiance to the IDF at the Western Wall plaza on Thursday. This is the first swearing-in ceremony that has taken place since the two soldiers from the battalion were murdered in a shooting attack in Givat Assaf. The fighters proved that despite the loss, many young haredim wanted to enlist in the battalion. During the swearing-in ceremony, the soldiers said "I declare" instead of "I swear" as is customary in the swearing-in ceremonies. The ceremony concluded with the soldiers singing “Am Hanetzach”. The condition of another battalion fighter who was wounded in the attack at Givat Assaf, Netanel Felber, remains serious and doctors are fighting for his life. Last week, a prayer vigil for Felber was held at the Western Wall plaza at the initiative of the battalion's graduates.